On a starry, starry night in the land of the Southern Cross - Australia - John Koenders' life changed forever! He discovered, with records from the Dutch archives, that he is a direct descendant of the great Dutch Master - Vincent van Gogh - a true icon of the art world! John has been a professional artist for over forty years, and this revelation has brought a new dimension and provenance to his work. It seems - genes don't lie! Since that fateful night, many more interesting facts have come to light. Vincent's Maternal Grandmother was John's ancestor, and her daughter - Vincent's Mother, painted herself and is the one who taught him to paint and nurtured his deep love of nature. John's Gt. Grandfather was also an artist, and Vincent's nephew, and it is believed he even painted at times with the great Master. 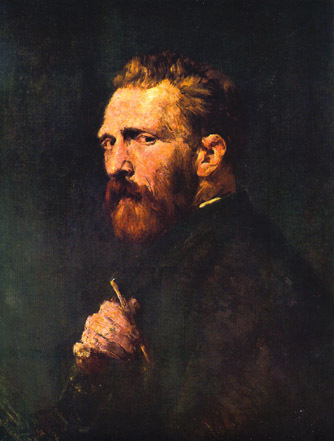 Apparently, Vincent had many Australian artists as friends, including John Russell (who painted Vincent's favourite portrait of himself - shown here), and John Longstaff, etc. Also, in an edition of Readers Digest (from the 90's), a very elderly French lady recalled a meeting with Vincent van Gogh when she was a young girl, and related the fact that he was known in Arles, Provence in the South of France as "Dingo" ) this is a truly uniquely Australian word, and is the name of our native wild dog. One wonders if Australian Artist friends may have given Vincent this nickname due to his 'wild' behaviour and appearance? In stark contrast to the tortured life of Vincent, who only sold one painting in his entire career, John has been truly blessed to be hugely successful in his career, and along with his wife - Di - who is also a professional artist - has sold a vast number of paintings worldwide - including to Royalty, Dignitaries, Art Collectors and Art Museums. Naturally, this recent news has brought provenance and extra value to their work. It is believed that John (apart from his children), is the only known living descendant of Vincent van Gogh who is a professional artist! Perhaps the great Master would be happy that, following on from his connection with Australian art, descendants of his are carrying on his wonderful legacy - and, who knows, maybe this tragic man can rest a little easier knowing that his spirit lives on under many starry, starry nights, in the beautiful land of the Southern Cross - Australia!